We are delighted to launch the call for the third Coimbra Group Three-Minute-Thesis (CG 3MT) Competition. We invite all CG member universities to participate in the 2019 edition, which will take place during the CG Annual Conference at the Jagiellonian University in Krakow (5-7 June 2019). Developed by The University of Queensland (UQ), the 3MT competition consists of effectively explain one’s research in three minutes, in a language appropriate to a non-specialist audience. Competitors are allowed one PowerPoint slide, but no other resources. Deadline for submitting your entry: 31 March 2019. Congratulations to Khalil Shahramian, PhD candidate at the University of Turku on winning the first prize of the 2018 Coimbra Group Three Minute Thesis competition at the final that took place at the University of Salamanca last 1 June. Congratulations also to Jason Dydynski (University of Tartu) and to Nicola Seitz (University of Würzburg) on being the runners-up and to Constantina Theofanopoulou (University of Barcelona) for the participation. An initiative of the Doctoral Studies Working Group, the CG 3MT competition first round took place in April. All CG Universities were invited to participate by submitting the video of the finalist from their own internal competition. 21 PhD candidates (from 21 CG Universities) took part in the first round. The panel was composed by the members of the Doctoral Studies WG, and, in the case of those universities with no representative in the Doctoral Studies WG, the CG Representative was invited to cast the vote on behalf of his/her university. A total of 22 CG Universities submitted their vote. Voters were requested to assign 3, 2 and 1 point(s) to their preferred top three candidates. The Coimbra Group held its first 3-Minute-Thesis (3MT) competition in 2017. We are happy to announce that Mr Oisin McCormack (University of Padova, left on the photo) is the winner of the 2017 CG 3MT competition! 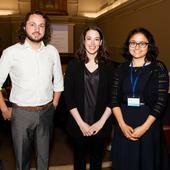 Ms Tanvi Butola (University of Göttingen, to the right) won the second prize while Ms Maddie Long (University of Edinburgh, in the middle) won the third prize. We wish to thank all three finalists for their outstanding performance! Developed by The University of Queensland (UQ), the competition consists of effectively explain one’s research in three minutes, in a language appropriate to a non-specialist audience. Competitors are allowed one PowerPoint slide, but no other resources. An initiative of the Doctoral Studies Working Group, the CG 3MT competition first round took place in April. All CG Universities were invited to participate by submitting the video of the finalist from their own internal competition. 20 PhD candidates (from 20 CG Universities) took part in the first round. The panel was composed by the members of the Doctoral Studies WG, and, in the case of those universities with no representative in the Doctoral Studies WG, the CG Representative was invited to cast the vote on behalf of his/her university. A total of 21 CG Universities submitted their vote. Voters were requested to assign 3, 2 and 1 point(s) to their preferred top three candidates. Tanvi Butola, Maddie Long and Oisin McCormack were the finalists of the first round. They then competed against each other at the live final which took place during the CG General Assembly at the University of Edinburgh on 9th June 2017.